Question: Lately, I have been suffering from sinus drip and a dry mouth. I have a leaking in my sinuses which runs down the back of my throat. As a result, my saliva is very thick, which leaves my mouth dry, all day every day. I drink a sufficient amount of water daily to combat this. However, its been to no avail, as my breath stinks all day. Constant brushing does nothing to help my bad breath. What can I do to improve my symptoms? Please advise. Sinus drip or post-nasal drip syndrome stems from nose and sinus problems and can cause some unpleasant symptoms to occur, such as halitosis, coughing, as well as a blocked or runny nose. To help rid you of this condition, pinpointing the cause of your sinus drip is necessary. Several conditions can cause post-nasal drip, including sinusitis, hay fever, upper airway cough syndrome, and rhinitis. While self-care and home remedies will not treat your condition, they can help improve and manage your symptoms, no matter the underlying cause. While you are experiencing post-nasal drip syndrome, be sure to stay hydrated. Drink plenty of fluids, which will help thin mucus secretions. Just stay away from caffeine and alcohol, they can dehydrate you and make your symptoms worse. You can also wash out the nasal passages with a neti pot or a saline nasal spray to help thin out mucus, as well as flush out irritants and allergens. Just make sure you don’t use this method too much, as it could have the opposite effects of what you are going for. If you are still experiencing sinus drip and a dry mouth, I would advise a consultation with an ENT specialist. You could have a sinus infection and or silent acid reflux, and these symptoms will not go away until you get the underlying problem corrected. The treatment methods and medications used will vary depending on the underlying cause of your sinus drip, so make sure you see a doctor if your condition still hasn’t improved. Is it Time for Sinus Surgery? Question: Hello, First off, thanks for taking the time to read and answer. I would like to know is it time for sinus surgery, but please, read my background first. I have been having sinus issues for about 6-7 years now. At first, I just dealt with it—runny nose, sinus infections, etc. Rarely took anything, just figured it was normal colds. So after three years or so, I noticed my left nostril would be blocked. It ended up being blocked about 95% of the time. I went to see an ENT. They took a CT scan. Said I had mucus filling all my sinus cavities. They also said I had a deviated septum. Not real bad except in one area where they said “Severe deviation.” They prescribed Flonase at the time. I tried it, worked OK, but whether it was the medicine, or me just getting worse, my sense of smell and taste really started to go away. I still had a faint sense, but it wasn’t nearly as good. I quit the medication for fear it was the issue. After another two years of suffering and taking allergy pills which seemed to help (Alegra), I went to my allergist. I could hardly smell at all anymore, and I was getting very depressed about it. These people were 100% more caring and helpful. They looked at my old CT scan, told me it showed infection, which the ENT never said anything about. They tested me for environmental allergies, and I was basically allergic to everything, pets, grass, dust, mold, trees, etc. But, I rarely get itchy eyes, its just congestion, and constant clear, bubbly mucus. I blow it out, more there, blow it again, more there. They prescribed Prednisone and an antibiotic to see if we could improve anything. I was also given a nasal inhaler (Q-Nasl). I took the medication, and for the first time in years, I could smell!! I almost started crying. I was so happy. Well, that only lasted for about as long as the prednisone. I got another CT scan, and they said it was better, but not really much had changed. I still had mucus build up and the infection. Over the course of the last year, I have taken Q-nasal daily. My sense of smell is now essentially nill. I can’t taste food, and I am at the end. I can’t take it any longer. Over the last three weeks, I have been taking nettle leaf capsules to try and help with allergies if that is my issue. I have even gone through nasal irrigation and the “Friggy Flip Turn” sinus rinse method, Google it if you have never heard of it. That seems to help clear out all sorts of gunk, but my left side is still persistently closed off. I can breathe easier for sure since my visit last year. Let’s call it 50% blockage of airflow now on the left side. But my smell is gone still. But keep this in mind…when I eat food or want to smell something, If I blow out of my left nostril, I can usually pick up on smells and tastes. So it’s not gone. It came back with prednisone, so I know its still there. After I blow my nose on the left side, you can even hear like pressure releasing and squeaking. I can feel it happen. It’s like no room for things to go. Like a big build up with only a small opening but lots of pressure. But why can I hardly smell out my ride side? I would figure with one nostril I could still smell a little, but not really. The question is, is it time for sinus surgery? What else can I do? Will it help bring my smell and taste back? I know there are no guarantees, but is there a good chance that I just have a blockage with my septum, that causes excess mucus and blocks air from traveling to the olfactories? I am thinking of going back to a new ENT and giving them the run through and go from there. At this point, it’s hard to enjoy life. I would suggest that you carefully research the sinus specialist you ultimately choose to do your surgery if it is indicated. Unlike many other types of surgery, different individuals do sinus surgery very differently. I would suggest seeing someone who practices the most up-to-date type of endoscopic surgery and has a great deal of experience. Some otolaryngologists are still performing older types of surgery, which are much less successful and in fact, can ultimately lead to more problems than you already have. I haven’t been able to smell my entire life. Do I have congenital anosmia? I haven’t been able to smell my entire life (I put my birthday as the onset date). A doctor I went to diagnosed it as “congenital anosmia” but couldn’t do anything more for me. He prescribed an oral corticosteroid plan but I had no change in my ability to smell, so he said there’s nothing else he can do. I’m hoping there are more resources out there. I put severe migraines as a symptom because as a young child I used to get terrible migraines so bad I would randomly fall over. I got tests done though, and there was nothing out of the ordinary, and they no longer occur, so I’m not sure if that’s relevant, but I wanted to put it regardless. I’ve tried taste testing because I know that smell greatly affects taste. When I did a blind taste test, I had absolutely no idea what I was eating. However, I have favorite foods, and there are things I don’t like so I know I have a sense of taste, but I just can’t recognize any specific flavors. I’m not from New York, I’m from Pennsylvania, but I’m just hoping for some answers or some other resources or some clinical trial somewhere, or basically anything. Nobody else I’ve seen has been able to help. First of all, thank you for your question. As you obviously realize, the loss of smell can cause many problems. We use the sense of smell to detect danger—varying from a gas leak to rotting food. The loss of smell interferes with our enjoyment of food and our daily activities. While about 1/5 of cases of loss of smell have an unknown cause, most can be related to a viral infection, head trauma or infection. A small group is born without a sense of smell. This is called congenital anosmia. While this can be due to a mutation on chromosome 18, the most common syndrome causing congenital anosmia is Kallmann’s Syndrome. Kallmann’s Syndrome’s two most common findings are the congenital absence of smell and delayed puberty. While we are still not able to find a way to help with the lack of the sense of smell, once diagnosed, hormonal therapy will be successful in treating the delay or absence of sexual maturation. One can usually differentiate congenital anosmia from the loss of smell that may have occurred in infancy by an MRI of the olfactory bulb. 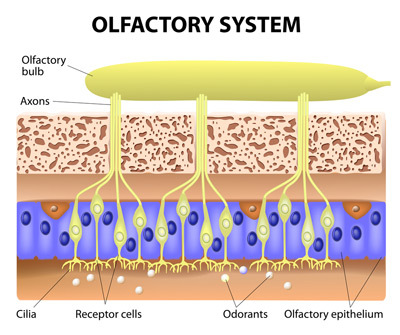 The olfactory bulb is an area in the brain, just above the sinuses, where the smell nerves are located. The olfactory bulb may be absent in people born without the sense of smell. While we have therapies that have been shown to help for acquired anosmia, so far we do not have a good therapy for its congenital absence. Work, though, is being done. A study at the University of Michigan a few years back showed good results in treating mice with congenital anosmia. One of the nations leading centers for the study of the sense of smell is at the University of Pennsylvania Smell and Taste Center. While we’d be happy to see you at the NY Sinus Center for this, you might start by going there for an evaluation and to see whether you may be a candidate for one of their studies. What is causing fluid to flow from my nostril? Once on the first of Oct and again on the 25th of December 2014, I was sleeping and I woke up both times with this fluid gushing out of my left nostril. In June 2014 I fell and had quite a serious fall on my left side. I had a huge lump on my head and had a J/C shoulder separation. I would like to know what causes this fluid problem? It is possible that the fluid coming from your nostril could be cerebral spinal fluid. This could result from a fracture of the skull base which is the thin bone between the roof of the nose and sinuses and brain. You should see an otolaryngologist who will most likely ask you to collect the fluid so it can be analyzed in a lab, get CT scan and/or MRI scan and perform a nasal endoscopy. Is there any reason for septicemia in the condition of atrophic rhinitis? Question: Is there any reason for septicemia in the condition of atrophic rhinitis? Answer: Thank you for your question. Atrophic rhinitis, also known as ozena, is a condition in which the nasal cavity loses its ability to serve as a filter due to chronic inflammation of the nose. While atrophic rhinitis is a chronic nasal condition that has an unknown cause, it causes the formation of thick dry crusts in a normally roomy nasal cavity. This is a result of a decrease in size (atrophy) of the nasal mucous lining and the underlying bone. However, while this condition is characterized by the atrophy of the nasal mucosa, it also includes the turbinate bones, the glands, as well as the nerve elements that supply the nose. Normally, the air we breathe in should reach 98.6 degrees F and 100 percent humidity by the time it reaches the back of the nose. The common symptoms associated with atrophic rhinitis include a runny nose, a stuffy nose, nosebleeds, nasal crusting, nasal deformity, a sore throat, a decreased or loss of smell, as well as frequent upper respiratory infections. Aggressive surgery, or chronic infection, can cause scarring and the loss of the function of the nose. It can result in crusting, stuffiness, a bad odor and increased risk of infection. Septicemia (a blood-borne infection), while possible, would be quite rare. Treatment for atrophic rhinitis includes humidification, treatment with ointments and irrigations with a Netti pot or nasal flush. Using nasal irrigation is usually the first line of defense, as this treatment option can help improve tissue hydration and can help reduce crusting in the nose. However, it is important that you irrigate your nose several times a day, and the irrigation solution that you use could be a saline solution, a mixture of other salts, or even an antibiotic solution. I had punctured sinus from left molar extraction. Can an MRI show if my sinus has healed properly? Question: I had punctured sinus during left molar extraction. The socket was not closed properly and needed repair work 4 days later to close socket. I have had bouts of nasal congestion, burning sensation in nasal cavity, light headedness. Tilting my head back seems to help sometimes. I am not sure my sinus healed properly. Have had pulling sensation in left nostril. Noises in left ear have been diagnosed as eustachian tube dysfunction. First problem with ear was suctioning sound when I yawned (socket had sealed). Then clicks when congested. Now clicks randomly. Can an MRI show if my punctured sinus has healed properly or is a CT scan required? Answer: First of all, thank you for your question. The roots of several teeth- especially our molars, can be quite close or actually within the maxillary (cheek) sinus. Infections in the tooth roots or dental extractions can spread infection into the sinus- and are typically difficult to treat as the oral bacteria are often quite virulent. Treating odontogenic (dental caused) sinus infections involves appropriate antibiotics- usually best based on an actual culture- and treating the dental problem. Today, we will often use balloon sinuplasty- opening up the sinus with a balloon in the office- to drain the sinuses if needed. The best way to see if a sinus infection has resolved is with CT scanning. Low dose scans can be done, and while the radiation is less than with typical scans, there still is some radiation. 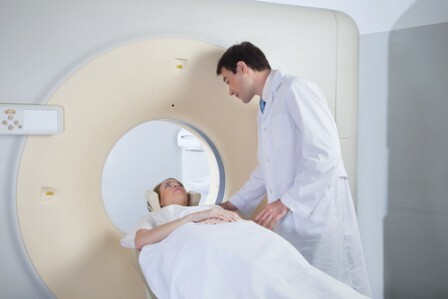 MRI’s use electromagnetic waves rather than radiation, but do not show bone- and tend to over read sinus problems. They are much less useful, but a normal sinus MRI would probably be enough to avoid using CT scanning. My mother has a hole in her septum. What can we do? Question: My mom lives in Ocala, FL. My mom’s problem is a hole up in her sinus that seperates the left and right nostril (perforated septum). She has had a ‘button’ put in but it had to be removed about a week later, due to the hole , in her nose, being too big. She then had a filter put in but it became infected and ,also, had to be removed and her nose cleaned by suction. Every day she is blowing her nose with alot of mucus being discharged. I am very concerned because nothing seems to work and the doctor, she is seeing, doesn’t seem to know whatelse to do. Answer: The septum is the room divider, dividing the nose into two passages. While it is never completely straight, a deviated (twisted) septum can block air flow in the nose. Sometimes in surgery, or often after trauma or certain medications (cocaine quite commonly), a hole (perforation) develops from one side of the nose to the other. When small, this may cause no symptoms, or perhaps a whistling sound with breathing. Large holes disrupt the smooth flow of air through the nose and create drying, crusting and bleeding which often cause the hole to get larger over time. Small holes may be fixed surgically, but surgery is much less successful with large ones. Generally, a septal button will fix a perforated septum when the holes are too large to close (plastic prosthetic septum). It allows for a normal, smooth flow of air, and the button is generally not felt by the patient. If the hole is too big for the usual sizes that are available, your Ear Nose and Throat Doctor or Rhinologist (Sinus Specialist) may be able to measure and have a special order one made to fit. Sometimes, surgery may be only partially successful, that is by making the hole smaller and then more amenable to a septal prosthesis. At times, there is no way to really get this closed. Should that be the case, the use of nasal saline sprays, topical moisturizing with nasal ointments, and seeing your ENT doctor for cleaning of the area should make things better. We, of course, would be happy to see your mom here at the NY Sinus Center. Is bloody mucus a sign of a sinus infection? Question: I have this head cold and blow my nose there is blood in the mucus which I think is a sinus infection. Is bloody mucus a sign of a sinus infection? Bloody mucus is a sign of irritation in the nose. This can come from trauma, dryness (quite common in cold weather with the heat on), chemical inflammation, infection- viral or bacterial, and least likely from a tumor or other growth. While it is quite common with a sinus infection, there are other causes and if you have this persisting, it should be evaluated by an Ear, Nose and Throat Doctor or Sinus Specialist, using a lighted telescope in the nose to evaluate. I have atrophic rhinitis. I felt great after one month of Levaquin, then it came back. Question: Thank you very much for allowing us to ask questions. I have atrophic rhinitis. Can this be caused by allergies? I have many airborne allergies. Also, how would you culture the bacteria? Mucous? Or swab (this does not seem to work)? I took one month of Levaquin and for that month and the month after I felt great. Then it came back. Is there a better protocol? I saw medical articles that said three months of Cipro, or rifampin or streptomycin injections where curative. Any guidance would be truly appreciated. Thanks for your question. Atrophic rhinitis implies that the tissues of the nasal and sinus cavities are damaged and have lost much of their ability to function well. The job of the nose and sinuses is to humidify and warm air (to 98.6 degrees and 100% humidity) by the time the air gets to the back of the nose. The mucous is both a lubricant and catches particles (viruses, bacteria, dust, etc.) and brings them down the back of the nose to the throat where they are swallowed and destroyed by stomach acid. Atrophic rhinitis is usually NOT caused by allergies- but more commonly by damage to the tissues- either from removing too much during a surgical procedure- or from scarring from infection, caustic nasal medication (cocaine, Afrin abuse) or sometimes an unknown cause. Allergic rhinitis is called Atopic rhinitis- so you just want to be sure of the correct terminology. Atrophic rhinitis can be best treated often with topical medications in the nose- ointments such as Bactroban placed on a fingertip just on the inside of the nose- and with nasal rinses (Saltaire, NeilMed)- at times with medications such as antibiotics and steroids in the rinse. Alternatively, the use of sinus nebulizers (deliver fine mists) with hypertonic (extra salty) salt water with or without the same medications can be helpful. Sinus cultures need to be taken off the mucous directly where it comes out of the sinuses to be accurate. This needs to be done with a telescope in the nose (a blind nasal swab is not helpful), and I would expect this to be done by any sinus specialist. While we know the most common organisms causing sinus infections statistically, each individual may have an unusual organism, and it is always best to treat with the most appropriate antibiotics when needed.